I stuffed some suet in the bark of the tree outside the window and was amazed at how fast the woodpeckers, nuthatches, and chickadees discovered it was there. Then I was fascinated by the antics they displayed in determining the pecking order for a seat at the table. I watched as the downy, red-bellied, and hairy woodpeckers exhibited behaviors related to conflict, food-storing, and even a little showing off and courtship. They were dodging and shifting around the trunk of a tree sometimes with a Black-capped Chickadee as the imaginary assailant. I also watch wild, erratic flight as the woodpeckers looped in, out, and around, the tree as if being pursued by a hawk. 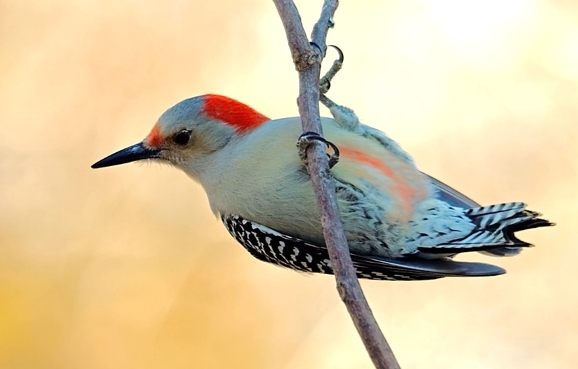 Other behaviors to watch for with the Red-bellied Woodpeckers is occasionally tapping on the trees with slight provocation perhaps as a part of practice courtship by juveniles, and also storing, miscellaneous objects, and food in the trees crevices.